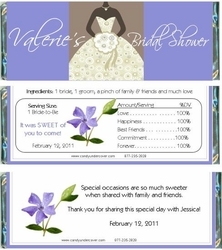 Our ELEGANT BRIDE design is one of our most popular Bridal Shower candy wrappers! And you can see why. This chocolate wrapper adorns a lovely Wedding dress, and fabulous color! Perfect for Bridal Showers, Weddings and more. Chocolate is the SWEETEST favor and is sure to be a hit at your party!